The Entire YGF02 body is made from PPS composite so there is no danger of corrosion. The space age composite PPS (Polyphenylene sulphide) has a high level of resistance to salt damage, high and low temperatures, impacts, chemicals, UV and its highly flame retardant. It is also suitable for use with E10 and E20 ethanol fuel mixtures. Transparent Bowl with red ball that shows if water is present. The most efficient system available for removing dirt before it enters the injection system. 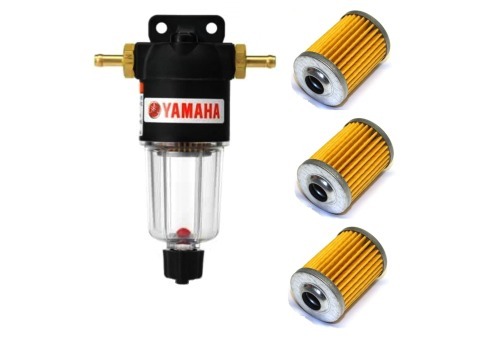 The Yamaha 10-micron filter will protect your engine by removing dirt, water and small foreign particles. Hose connections are 7mm. Element installed ready for use. Elements Available in Our Other Listing.